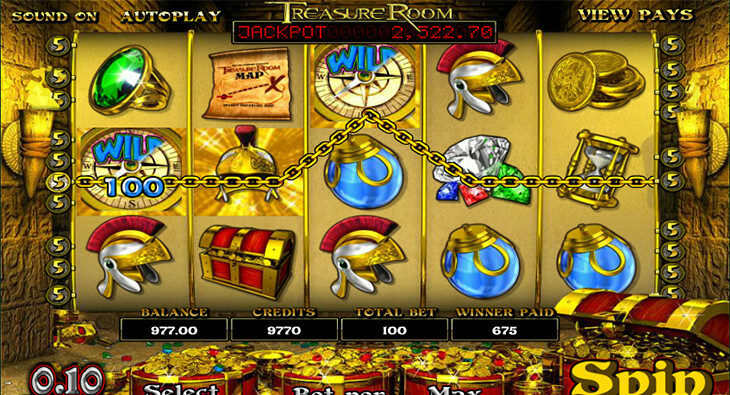 Treasure Room is another winner from BetSoft Gaming.It features a standard 30-paylines over 5-reels grid structure. The game is designed for online play and has many features to help the gaming public strike it quasi-rich as slots play goes. Some of those features include fun and lucrative bonuses like the Shield and Sword, and the Treasure Room Bonuses. BetSoft spared no gold coins in designing the layout, the graphics, the sound effects and the soundtrack. When taken together with the mystery of searching for the lost Treasure Room, the game itself is, indeed, a true treasure. The theme of the game explores secret Roman Treasure that was hidden by the Emperors at the height of the Empire. But you have the proverbial map and with it,you will soon find your way to the Treasure Room where your eyes will feast on a bounty of valuables like Diamonds, a Trojan Helmet, Gold Coins, a Treasure Chest, Gemstone Rings, a Treasure Map, an Hour Glass, and miscellaneous other Artifacts. The game is in 3D and high definition, which displays very well online, especially if your machine has a monster graphics card installed. With the many features as set out above, it is only a matter of time before you get size able payouts. Plus, the great theme,the detailed story line,and the historically accurate plot will keep you thoroughly entertained as you rack up the coins. Treasure Room slots has a few special symbols and extra features that are very rewarding as well as a Roman galleon full of fun and excitement. The Compass icon, for example, represents the game’s Wild. The Wild traditionally replaces all less powerful symbols that land on the reels, but never can it replace the Scatter. When the Compass symbol replaces the inferior symbols it does so in an effort to form winning combinations that will pay the gamer additional coins. The game’s jackpot icon is the much sought after Treasure Chest. If you can manage to land at least 5 Treasure Chests on a single payline while you have all 30 paylines active and filled with the maximum amount of coins, you will benefit from not only a Standard Jackpot but a Progressive Jackpot as well! Fancy that: Two Jackpots in a single game. Gaius Julius Caesar eat your heart out. But the fun is not over yet,because Treasure Room slots gives you another exciting feature that opens up on a second screen when triggered. It is the Click Me feature and it will get your attention every time, especially when the sound effects kick in. When triggered, the on-reel Click Me Bonus will pay from 125 coins up to 5,000 coins and then if you match at least three Shield or Sword icons on an active payline you are rewarded an instant win for your efforts. Make a selection between the Sword and the Shield to discover what new prize you have won. Whatever your winnings are after this spin, they are enlarged by a multiplier that increases the total value of the bets you placed on each active payline. In this particular game, if you can afford it, it is best to bet the maximum number of 5 coins for every payline because the Progressive Jackpot may only be triggered with a maxim bet on each payline. And arguably the object of every slots game is to hit the jackpot. Landing three or more Sun Dials symbols on an active payline will activate the Second Screen Bonus. It will display 3 doors which have 3 rare gemstones each. You will be prompted to select a door from among the three, and when you do, your lucky prize will be unveiled to you. This is one of the highest paying features of the Treasure Room slots. Coin values of the Treasure Room slots game range from 0.50 to 0.02 per coin. With Treasure Room slots, you can monitor your payout balance, winnings per spin, winnings for each bonus round, and adjust and customize your personal settings, thereby enhancing your online gaming experience. The substantial payouts, the professional and modern design, and the endless bonuses are enough to keep the most jaded slots player coming back for more. When playing Treasure Room slots you know you are playing a top quality, high-def game withcrystal clear 3D graphics. The game provides you with big fun and significant chances of substantial winnings. The game is easy to learn, easy to play and easy to master. It has a simple user interface that puts all the controls at your fingertips and in plain unobstructed view. Paylines, coin denominations, bets per line, betting buttons and the Spin button are marked clearly to help you have a relaxing stroll through the Treasure Room. Finally, the online version is free to play, you don’t require to download any application, requires no signup, and contains no ads. The game is compatible with browsers like Microsoft’s Edge, Otello’s Opera, Internet Explorer, Mozilla’s Firefox,and Google’s Chrome, but it is not yet a part of BetSoft’s Mobile To Go smartphone and tablet platforms.